At Pro Restoration, Inc., we define a plumbing emergency as any situation that puts water where it doesn’t belong. Plumbing emergencies can cause a great deal of damage. Water leaks and flooding can happen for numerous reasons. Regardless of the cause, one rule always applies: Get expert repair services as soon as possible. Pro Restoration, Inc. has the right resources and discovery recovery experience to respond quickly to your plumbing emergency and provide effective repair solutions. We provide fast written estimates for emergency water damage repair throughout the Greater Los Angeles County area, including Van Nuys, Woodland Hills, Westlake Village, Sherman Oaks, Canoga Park, and nearby cities. When a pipe bursts or a water heater begins to leak, the water doesn’t automatically turn off. Water keeps leaking where you don’t want it to go, damaging and often ruining wallboard, carpeting, furniture, and other items. Give us a call at 1-855-512-6813 or get an online quote to have your home inspected and to restore your property following a flood or after a plumbing leak or burst pipe dumps water where you don't want it. 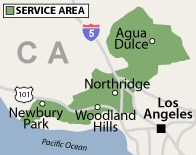 We are Greater Los Angeles County's water damage restoration experts serving Calabasas, Newbury Park, Pacoima, Granada Hills, Northridge, North Hills, Encino, and the surrounding area! Contact us to learn more about how we can help.